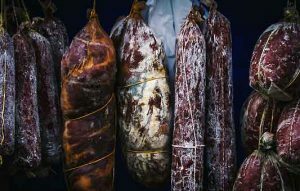 The Johns Hopkins Medicine researchers found that a history of eating nitrated dry cured meat but not other meat or fish products was strongly and independently associated with current manic episodes in humans. Nitrates have long been used as preservatives in cured meat products and have been previously linked to some cancers and neurodegenerative diseases. An analysis of more than 1,000 people with and without psychiatric disorders has shown that nitrates may contribute to mania, an abnormal mood state characterized by hyperactivity, euphoria, and insomnia. Lower odds of association were found between eating nitrated dry cured meat and other psychiatric disorders. The Johns Hopkins Medicine study was not designed to determine cause and effect. Researcers also found that the feeding of meat preparations with added nitrate to rats resulted in hyperactivity reminiscent of human mania, alterations in brain pathways that have been implicated in human bipolar disorder, and changes in intestinal microbiota. The researchers say that their new study adds to evidence that certain diets, and possibly the amounts and types of bacteria in the gut, may contribute to mania and other disorders that affect the brain. “Future work on this association could lead to dietary interventions to help reduce the risk of manic episodes in those who have bipolar disorder or who are otherwise vulnerable to mania,” says lead author Robert Yolken, professor of neurovirology in pediatrics at the Johns Hopkins University School of Medicine. Between 2007 and 2017, as part of an ongoing study, he and colleagues collected demographic, health, and dietary data on 1,101 individuals aged 18 through 65 with and without psychiatric disorders. Cured meats were not associated with a diagnosis of schizoaffective disorder, bipolar disorder in people not hospitalized for mania, or in major depressive disorder.